Revive thy Church, Lord God of hosts, whensoever it doth fall into complacency and sloth, by raising up devoted leaders, like thy servant John Henry Hobart whom we remember this day; and grant that their faith and vigor of mind may awaken thy people to thy message and their mission; through Jesus Christ our Lord, who liveth and reigneth with thee and the Holy Spirit, one God, for ever and ever. Revive your Church, Lord God of hosts, whenever it falls into complacency and sloth, by raising up devoted leaders, like your servant John Henry Hobart whom we remember this day; and grant that their faith and vigor of mind may awaken your people to your message and their mission; through Jesus Christ our Lord, who lives and reigns with you and the Holy Spirit, one God, for ever and ever. After the American Revolution and the Independence of the United States, the Episcopal Church, under public suspicion in many quarters because of its previous association with the British government, did very little for about twenty years. John Hobart was one of the men who changed this. John Henry Hobart was born in Philadelphia, Pennsylvania, 14 September 1775, the son of a ship's captain. He was educated at the University of Pennsylvania and Princeton University, ordained deacon in 1798 and priest in 1801. 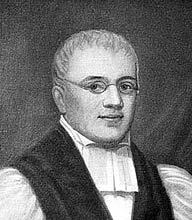 Called as assistant minister to Trinity Church, New York, in 1803, at age 36 he was elected assistant bishop of the diocese in 1811, becoming diocesan in 1816. To look at John Henry Hobart, you wouldn't have predicted greatness. Height always distinguishes, and he was notably short. Blessed with attractive blue eyes, he was nearsighted and forced to wear thick glasses. In an age of marmoreal gestures in the pulpit, he was melodramatic. At a time of dignified eloquence, he spoke rapidly, with emotion. When most men were reserved, even with their families, he was warm, whether with ambassadors or farmers, to the point of being thought odd. Most bishops were content if they bestirred themselves for episcopal acts a hundred miles from home. Hobart had the energy of ten men: horses dropped under his exertions and he thought nothing of a winter visitation of 2,000 miles in western New York or 4,000 at a more seasonal time. Early in his career he tackled publicly issues still dubious in the American mind: episcopacy and apostolic succession, arguably besting in print a redoubtable Presbyterian opponent. He founded two institutions: a college in Geneva (later Hobart College) and General Theological Seminary in New York City, breaking his health to get both off the ground. He not only looked after the Diocese of New York (46,000 square miles and virtual wilderness west and north of Albany) he served as rector of Trinity Parish, the wealthiest and most influential church in the country. Agreeing to oversee the diocese of Connecticut, since its high- and low-church party roils had prevented the election of a bishop, he covered its parishes more thoroughly than any bishop ever had. New Jersey, similarly bishopless, appealed to him, and he looked after it as well. He knew all the clergy in the Church generally and in his own diocese intimately. He was aware of their background, remembered their families, forgave their frailties, and appreciated their strengths. He watched over his candidates for Holy Orders with a paternal interest, meeting with them weekly. His instinct for politics never overrode his principles. Once convinced of the rightness of his position, no wave of unpopularity would budge him. His friends adored him and even his enemies credited him with frankness and fearlessness. He held no grudges and played no games, two qualities that endeared him to many. In a turbulent New York State election for governor, a common saying was that only Hobart would have been easily elected. He took 26 clergy at the beginning of his episcopate in 1811 and quintupled them to 133 by his death; watched the number of parishes increase from about 50 to almost 170; and confirmed roughly 15,000. This lovable, indefatigable, type-A bishop went virtually nonstop from his ordination until his death. The only surprise was that he didn't die sooner. At midnight, September 7, 1830, a young clergyman rode in a stage through Auburn on his way to Binghamton. Passing the rectory of St. Peter's Church, he was puzzled to see a light so late. He rapped for the stage to stop and soon learned from the rector, John Rudd, that Bishop Hobart was ill. Francis Cuming remained to assist in any way he could. Hobart's illness wasn't that surprising. Troubled for years with what was most likely a bleeding ulcer, with rest and medication he would generally rebound. In Auburn he had preached and confirmed and other than a slight cold, seemed fine. But soon the serious nature of his attack became clear and he cancelled the remainder of his visitation. Over the next few days, he frequently requested to hear portions of Lancelot Andrewes' litany, in which he would join. Amidst his pain, Hobart found time to offer advice to Cuming: "Be sure that in all your preaching the doctrines of the Cross be introduced: no preaching is good for any thing without these." Cuming writes: "His pains were so severe he could not give his mind to them unless they were short, and when I had invoked our Heavenly Father to continue to be gracious to his suffering servant; and that whereas he had studied to approve himself to God upon earth, he might be permitted to stand approved by his Master in heaven, he interrupted me by saying, 'Amen: O yes, God grant it, but with all humility I ask it.'" "On Friday, September 10th, just before the going down of the sun, and as its last rays had forced themselves through the blinds, and were playing upon the wall not far from the bed, he said, 'Open the shutters, that I may see more of the light; O how pleasant it is; how cheering is the sun--but there is a Sun of Righteousness, in whose light we shall see light.'" Cuming again: "There were times when he was peculiarly oppressed. The promises of the Gospel, however, would revive him. At one of those times he said to me with the most remarkable emphasis, 'Comfort me.' The reply was 'Bishop, it is written, the blood of Christ cleanseth from all sin.' - 'So it is, so it is,' he added; God be praised for that, God be praised for all his mercies - God be merciful to me a sinner!'" On Saturday, at a bedside service of the holy communion, when Rudd "came, in the confession, to the words, 'by thought, word, and deed,'" the bishop stopped him and said, 'You know the Church expects us to pause over those words: pause now, repeating one of the words at a time till I request you to go on.' This was done, and the pauses in each case were so long that a fear passed over our minds that he had lost his recollection or fallen asleep. This, however, proved not to be so; he repeated each word, and after the third pause added: 'Proceed, I will interrupt you no more.'" Early Sunday morning, September 12, 1830, John Henry Hobart died, aged 55. The funeral took place in New York City on September 16. The mourners included the governor of the state and the mayor of New York City, and the procession was estimated at nearly 3,000. The third bishop of New York is buried under the chancel of Trinity Church, New York.